In the late 1990's a group of dedicated Catholics in the Yuma community organized under the banner of the Catholic Foundation of the Diocese of Tucson to bring to fruition the long-discussed and much desired dream of Catholic secondary education in Yuma. Under the leadership of Howard Gwynn and Sonny Rodriguez, a series of parlor meetings were held and the idea of a Catholic high school was enthusiastically received. Fred Kipperman of Charter Associates in Tucson was retained to begin a capital campaign. Leadership gifts by Gary Oden and Gary Pasquinelli inspired the community to financially support the endeavor. 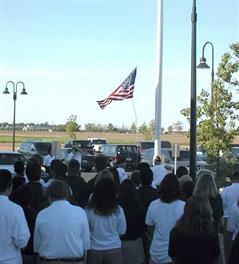 In October 1998, Yuma Catholic High School was incorporated in the State of Arizona. The founding trustees were Monsignor Richard O'Keeffe, Hugh Hegarty, Howard Gwynn, Gary Pasquinelli, Jeanne Vatterott-Grogan, and Joseph A. "Sonny" Rodriguez. These initial trustees worked tirelessly at developing the By-laws of the corporation, the philosophy of the projected school, the recruitment of additional Board members, continued fundraising, and the hiring of initial staff. Dr. John C. Monnig, the school's first principal, began work in the Catholic Community Service building in late 1998 along with the school's founding president, Fr. John F. Friel, O.S.F.S., who commuted weekly for several months from his last Navy assignment in Monterey, California. When Fr. Friel arrived full-time in March of 1999 he immediately recruited D. Michael Glynn to serve as interim Development Director. Fundraising continued in April, 1999 with the successful Field of Dreams Dinner Dance and Silent Auction held April, 1998 and a significant gift from Mr. Glen Curtis, honoring the memory of his wife Elena. This gift enabled the project to proceed. In November 1999, with the blessing of Bishop Manuel Moreno, Fr. Friel signed the construction contract with Pilkington Construction Company of Yuma. 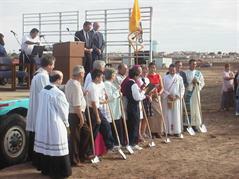 Bishop Moreno presided over the groundbreaking ceremony in January 2000. Also in January, Monsignor O'Keeffe and Fr. Friel traveled to Manitowoc, Wisconsin to invite the participation of the Franciscan Sisters who assigned Sr. Xaveria Whitman, Sr. Alexandra Bettinardi and Sr. Marie Kolbe Zamora to the initial faculty. Deacon Paul Muthart was recruited to the Board of Trustees and performed the herculean task of contract manager. Under his leadership, assisted by the late Hugh Hegarty, construction progressed on schedule. Meanwhile, Dr. Monnig continued work on the curriculum and recruited teachers, and Mike Glynn and Fr. Friel began recruiting the class of 2004. Mr. Tom Hurt was retained as the school athletic director and was exceptionally helpful in the recruitment process. 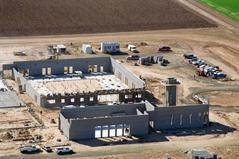 On Friday, August 11, 2000 the school received its certificate of occupancy from the city of Yuma. At 6 p.m., on Sunday evening, Mass was celebrated for all the supporters of Yuma Catholic High School in the courtyard of the new school. All local priests and deacons along with the Knights of Columbus Honor Guard and over 800 people were in attendance. Fr. Friel was the principal celebrant and began his homily by stating, "Jesus Christ is the reason for this school". Thunderous and prolonged applause by the congregation indicated agreement. On Monday, August 14, 2000, 76 enthusiastic, yet apprehensive, freshmen class began their high school careers as the Shamrock class of 2004. The next day was the Feast of the Assumption and the first all-school, all-student Mass was celebrated in the school library."